"You know, I talk to virtually everyone who buys our speakers." It was Bobby Palkovic, President and chief designer at Merlin Music Systems, during his third call to me before a review sample of his top-of-the-line VSM loudspeakers had arrived. "Our speakers are a paradox. They're incredibly revealing and yet they sound so very smooth--you'll hear nothing else like them.... They'll blow your mind." Bobby's a believer, I thought to myself while I listened to him. And then, I hope he's right. Should be fun. 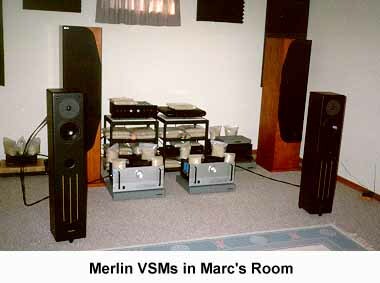 Merlin has been in business since 1983 and has exhibited its speakers at every CES show since. Over the years, they've made speakers of all sizes and prices, "bookshelf" systems as well as coffin-sized behemoths. Given this rich and varied history, it's somewhat surprising that their current lineup consists of just two models: the TSM stand-mounted monitor at $2100 a pair and the VSM Generation 3 R/Cs, a medium-sized floor-standing model that sells for $4500. Both of these speakers have gone through four years of steady development, and neither of them employs space-age or exotic means to reproduce music. They're both two-ways, bi-wireable, basic black with brass accents--lovely, I think, in an upscale, cosmopolitan, Natuzzi-leather sort of way. The VSMs, the subject of this sneak peek and next month's full review, aren't particularly large speakers--just a bit over 42 inches tall and under 9 inches wide. "Think of them as mini-monitors with integral stands," was Bobby's spin. Their rated frequency response, for those of you who have to know, is 45 Hz-22 kHz, +/- 3 dB. They measure -5 dB at 37 Hz and -10 dB at 30 Hz, so they won't be shaking your neighbors out of bed--or will they? They're 90 dB/watt efficient, which means that they'll soar with just a touch of power. Bobby recommends a minimum amplifier rating of 17 watts, so the VSMs will be appealing to you fans of low-powered tube amps. It's almost a reviewing cliché, "Component X uses only the highest-quality parts," but then something like the Merlin speakers comes along and you're called on your laziness. The TSMs use a Morel soft-dome tweeter and pulp-cone woofer, both fine drivers. The VSMs use what's rumored to be the finest tweeter available, the Dynaudio Esotar, along with a Scan-Speak carbon-fiber woofer. These two drivers are incredibly expensive--by my brief research, around $850 for a pair of speakers--and are used by other manufacturers as well. The Esotar, for example, handles the highs in the Eggleston-Works Andras and the Sonus Faber Extremas (both of which will cost you over $10k per pair), and the Scan-Speak woofer has shown up in ProAc models, among others. The internal parts list is equally dazzling: Hovland Music Caps, Caddock resistors, and Cardas Cross internal wiring, along with Edison-Price binding posts for connecting the speaker cable du jour. Add in the drivers, and there has to be well over $1000 in just parts--for a speaker that lists at $4500. Beyond the parts, however, is the execution, and here the Merlin VSMs also impress. The cabinet is made of 3/4" MDF with a 1 1/2"-thick front baffle and ample internal bracing for control of resonance. Inside, killing all of the music-robbing vibration it can, is a chamber filled with 23 pounds of sand. The corners of the cabinet are smoothly rounded to cut down on diffraction and give the speaker a very finished look--even with its lack of the almost-obligatory wood veneer. Perhaps the VSMs most unique design feature is the R/C networks that affix at the speaker terminals--"between the terminal caps and the speaker cable only," as Bobby let me know. The R/C networks perform some very specific functions, and they are not optional parts. First, they act as "high-frequency RF filters and EMI ameliorators" (in Bobby's words)--takin' out the trash, so to speak. Furthermore, they present the amplifier with an extremely high-impedance load--8 ohms nominal, 6.5 ohms minimum--making the speakers an ideal dance partner for tubes. Finally, the R/C networks get rid of ultra-high frequency resonance and in turn stop a form of interference that occurs between the speakers and the other components in your system. How positively diplomatic of them, what? Regarding setup, Bobby had this to say, "The VSMs are like a magnifying glass: once you get them dialed in just right, you'll see it all." Thus spending a little extra time to get the setup just right will reward you. To help you along, the VSMs come with a small wooden alignment device that determines the perfect amount of toe-in--10 degrees according to Bobby--and a level so that you can make sure the drivers fire exactly straight ahead. Without these tools, it would be much more difficult to optimize the speakers and thus get the most from them. You still have to determine how far they should be from your rear wall and the side walls (although Merlin helps you with this latter measurement too, recommending that the VSMs be no more than seven feet apart), but the tools make fine-tuning the speakers a breeze. The VSMs come with a pair of nicely styled grilles, although according to Bobby they're "for ornament and protection only, not for listening. I don't like them. "You also get a Merlin-made set of aluminum cones to couple the speakers to the floor of your listening room, although if you're like me and have a heavy Berber with pad that acts like armor to everything but the heaviest speakers, Merlin will send you a different pair of "bull dog" cones that will pierce your carpet and properly link the speakers to the floor below. There are many aspects of the VSMs that you don't directly unpack with the speakers--like the testing that Merlin undertakes, some of which is done outdoors, in God's anechoic chamber, as well as the obvious patience with which the speakers are built. Merlin spends eight days making just five pairs of speakers--VSMs or TSMs. Additionally, the VSMs are incredibly inert and pass the knuckle-rap test with flying colors. They're also surprisingly heavy (80 pounds) for their size, and most of this weight is due to the solid construction of the cabinet and the sand that's lovingly baked inside. Although I'm primarily a passive observer, I still find the high-end newsgroups fascinating, even inspirational. They're the mosh pits of our hobby, where ideas are presented, disseminated, torn apart, regurgitated, torn apart again, and finally, mercifully, killed off--although they don't always die a complete death. I found a recent thread on rec.audio.opinion interesting because it asked a rather fundamental question regarding the act of building a high-end system: what percentage of total dollars do you allocate to each component? I immediately remembered reading articles in Stereo Review which essentially argued that the speakers should get the lion's share of your dollars because they produce the sound. And I guess I believe this simple statement because my ProAc Response 4s are easily the most expensive thing I own other than my house. But I never really considered this question before I wrote the check for a piece of equipment--although maybe I should have. Where am I headed with this? To this month's topic of course (how's that for transparency? ), the Merlin VSM Gen. 3 R/C loudspeakers, which have caused me to rethink the amount of money anyone needs to spend on a pair of great speakers. At $4500, the VSMs challenge speakers that cost more than they do--even much more--and ultimately have made me believe that state-of-the-art performance doesn't have to cost a fortune. Same-old, same-old: CAT SL-1 Signature linestage, Quicksilver M135 and Clayton M70 mono amps, Timbre TT-1 DAC, and Wadia 20 transport. Interconnects and speaker cables are by JPS Labs (which Merlin enthusiastically endorses), digital cables and power cords by Marigo. I used a Chang 9600 ISO for the bulk of the review period, and a Marigo RMX Reference AC Distribution Center for a short time near the end. A bit of insight regarding the setup of the VSMs: although Merlin supplies tools that assist in getting the speakers situated, don't let them rigidly dictate where the speakers will ultimately rest. More than any other speaker I've had in my listening room, the VSMs can sound much better with even the smallest movement--an inch one way or another, or a slight twist in or out. The VSMs will sound reasonably good no matter where you put them, but they'll sound grand when you have them placed just right. So use the tools supplied, but as a final step experiment a bit with the distance between the speakers and toe-in. You just might discover an even sweeter sweet spot. The very first thing I noticed about the sound of the Merlin VSMs was the way they disappeared into the music they created. This is certainly due to their diminutive size--for a floor-standing speaker--and narrow front baffle. Recordings like Diana Krall's All for You seemed to emanate from no identifiable spot in my room, which is not to say there was no imaging but rather that the speakers were not heard as the starting point for the music. While my reference ProAc 4s conquer the room, melting away the walls around them, the Merlins surrender to the music and just completely vanish. This effect is very seductive--I just love being seduced--and it's something I can't imagine anyone would grow tired of, an instant and sustained WOW! But there's more. As I pointed out in my sneak peek, the VSMs use one of the most expensive tweeters available, the Dynaudio Esotar. Thus you would expect their treble to be outstanding, and it is. In fact, I've rarely heard treble that has as perfect a combination of extension and smoothness as that of the Merlin VSMs. Luka Bloom's Turf showcases his ability to write poignant songs as well as accompany himself on 12-string guitar. Through the VSMs, Bloom's playing had the requisite, uh, bloom--and full-bodied, steely sheen. These helped to reproduce a very believable account of an amplified 12-string in my room. The VSMs are also effortlessly dynamic, no doubt due to their 90-db efficiency, and sound incredibly fast and airy. I liken the VSMs' treble to a visual sensation, the one you get when you look into the sky and see no clouds--anywhere. The blue seems endless, and so does the VSMs' ability to resolve musically significant detail without etch or hardness. Continuing downward, the VSMs have tremendous midrange transparency, and in this respect, they have no peers among the many speakers I've heard. Voices have just the right combination of resolution and body, ultimately sounding closer to real than reproduced. Any system will approach this with Holly Cole or Keb Mo' playing, but with the VSMs, the sensation of the singers being in the room was consistent with almost every recording (except those that are overly veiled or washed out to begin with). I'm a great fan of Tom Waits (one of the few musicians I know of whose name is a complete sentence), and his gravely but expressive voice on Small Change, a recording from the mid-70s, was u-are-there present. On Bone Machine, Waits chants, howls and occasionally sings his way through dark songs punctuated with brooding atmosphere. You definitely don't want to listen to this CD late at night, and the Merlins make it all the more chilling--helping to produce real goosebumps. What don't the Merlin VSMs do? With a 6.5-inch midrange/woofer, they certainly don't go as low as the ProAc Response 4s or many of the other speakers I've had in my system or heard elsewhere in the recent past. The VSMs get down to about 40 Hz and then gently begin to roll off. Their bass is not "lite" however. Their smallish driver is very articulate, pushing the bass line on Keb Mo's "Dangerous Mood" (from Just Like You) along vividly, with adequate rumble when necessary. Still, I'm surprised that I didn't find the VSMs to be bass-challenged in the least. I'm guessing, first of all, that relatively few CDs have really low bass to begin with, and the discs I played just didn't stress the VSMs in this regard. More importantly however, I know that the strengths of the VSMs drew me so completely into the music that I just couldn't worry about what the they might not be doing. And this speaks to the very illusion that's at the heart of owning a high-end system: we know it's not real, but we want what we hear to make us believe that it is--in some primary way. The Merlins did this again and again, making any talk of their sound a trivial matter in light of the music they reproduced. By the time you read this review, however, Merlin should be in production of the BAM outboard bass alignment module designed specifically for use with the VSMs. I'm sure they've done this to address the concerns of those potential buyers who just have to be able to say to themselves, "Whoa, great bass." The BAM was designed in conjunction with JPS Labs, and it reportedly extends the VSMs' bass smoothly down to 30 Hz with no sonic degradation elsewhere. I'll be reviewing the VSM/BAM combination in the coming months. I'm skeptical, but I've got my fingers crossed. I don't know if it's a sign of good fortune or bad, but I've been able to hear a great number of speakers in the general price range of the VSMs over the last year or so--and a few pairs that cost considerably more. Like the Audio Physic Virgos, the VSMs are invisible when the music is playing, no small feat. They also have the tonal grace of the ProAc 2.5s and 3.5s, although they're more dynamic than either of these. They don't have the bass depth and slam of the Aerial 10Ts, but they surpass the neutral midrange of the Aerials and better them in terms of air and openness. And they have the extended treble of the Thiel 3.6es but without a trace of metallic edginess. This is a distinguished group of speakers, ones that you should audition before you decide on any of them. As for me, I'll take the Merlins. They embody so many of the noteworthy traits of the other speakers that in many ways you get the best of them all when you have the VSMs. But then there are the ProAc Response 4s. You may think that comparing a $4500 pair of speakers with one that costs four times its price is a waste of time, but the Merlin VSMs make this an educational experience--and an ear-opener to someone like me who owns the more expensive pair. The ProAcs are of absolute reference quality, having wonderfully extended yet sweet treble, a silky midrange that enhances presence, and nimble bass that extends to 20 Hz. The VSMs offer treble that's subjectively more extended but just as smooth, a see-through midrange that lets you hear every nuance, and bass that's articulate but doesn't go nearly as low as that of the 4s--but also doesn't sound anemic. The ProAcs have a golden-brown tonal character, while the Merlins are more honey-gold. Both are good eating. Although I wouldn't trade my Response 4s even-up for a pair of VSMs, if I didn't own the 4s, I'd own the Merlins. They're that good. The Merlin VSMs present a rich sonic package for a relatively modest price: treble extension without fatigue, midrange transparency that's the best I've heard, tight bass that may not extend to 20 Hz but doesn't sound noticeably weak, tremendous dynamics, and the ability to disappear into the music. Add to these traits the VSMs' contemporary beauty and a ten-year warranty and you have the best speaker value I know of. Blunt but true. To revisit, and revise, the question I pondered at the beginning of this review: how much money should you spend on your speakers? How about 50% of your total system budget? 75%? 25%? How about all of these if the Merlin VSMs are your speakers of choice. You could easily use the VSMs in a near cost-no-object system and get the goods, delivered; or you could pair them with lower-priced amps--either tube or solid state--and have great sound. You could also use them very successfully with most of the new breed of lower-powered but high-quality integrated amps, and perhaps even get a sense of what the 300B crowd is so excited about. I used the VSMs with top-of-the-line Quicksilver and Clayton monoblocks, but I bet they'd sound nearly as spectacular with lower-priced stereo models from the same manufacturers, so amp-friendly are they. In any case, the VSMs will reproduce music with consummate realism and emotional impact. Gracefully resolving, effortlessly musical, the Merlin VSMs are one of the finest speakers I've heard at any price. Bobby Palkovic and the gang at Merlin have produced a loudspeaker that they can be very proud of, and if you buy a pair, you can be too. The VSMs are magical.